Continental is far more than “just” tires – even within the Tire Division. Together with colleagues from an array of fields, system developers create comprehensive carefree packages for customers. For example, by means of the ContiPressureCheck system, the novel monitoring system for the tire pressure on trucks. Tires are not really Jörg Lehmann’s field. In spite of this, the electrical engineer with a doctoral degree has worked at Continental Tires in the Research and Development department in Hanover-Stöcken for more than 15 years. However, you will not find rubber samples or tread patterns on the desks in Lehmann’s area of Advanced Tires & Systems for commercial vehicle tires, but rather small black boxes and transparent plastic parts. A total of 40 different parts belong to the so-called ContiPressureCheck; an electronic monitoring system for tire pressure that Lehmann’s team has recently developed. “The subject of intelligent tires initially emerged for passenger cars,” recounts Jörg Lehmann, his alert eyes sparkling behind his rimless glasses. “Intelligent tires ‘speak’ to the vehicle by delivering valuable data for the electronic vehicle control systems, such as ABS and ESP. We considered what we could do for trucks.” The result is a sensor that is mounted to the tire and automatically measures tire pressure and temperature. The data is transmitted via radio to the display in the driver’s cab, which warns the driver in case of pressure loss. After all, too little air in the tires is the number one cause for truck breakdowns – with immense follow-up costs. With its Automotive Group, Continental has an in-house electronics division – the ideal partner for developing sensors in tires. The sensor is inserted in a small, protective rubber container that is manufactured by the colleagues at ContiTech in Timisoara, Romania. The receiver, the central control unit that receives the sensor signals either directly or via antenna, comes from the Interior division in Guadalajara, Mexico. “We specify the system in our department,” Jörg Lehmann explains. “This means we define what it must be able to do and subsequently release the individual parts.” The experts for each component do the rest. For such complex products as ContiPressureCheck, the experts are located all over the world in the entire corporation. 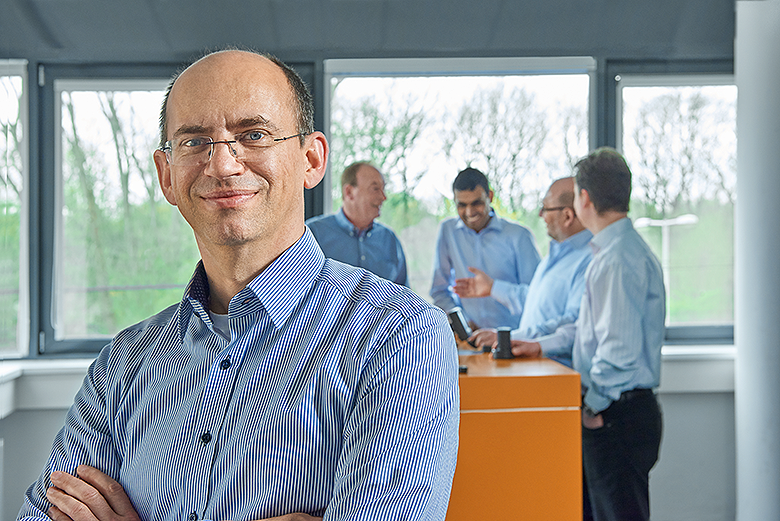 “Our technology enables many other highly interesting applications,” Jörg Lehmann explains, and bounces briefly into the neighboring office in his sneakers. He comes back with a small, transparent box in which there is a densely equipped circuit board – a prototype that is to be installed for the first time this afternoon for a test customer. The software for the control units, which appear to be quite trivial-looking but are in fact highly intelligent, is programmed by the research workshop “TrendAntenna” of Continental Automotive in Regensburg, where 40 students and researchers are working on digital solutions for the vehicles of tomorrow. “We have just been awarded the contract for the development of a new monitoring system. In this instance, it is not the driver but rather the fleet manager who is to receive the data in his office,” Lehmann explains enthusiastically. In the past, a customer required at least four hours to take a manual reading of the pressure in all the tires of 50 semi-trailers. In the future, it will only take two minutes – on a computer. “Since 2014, tire pressure monitoring systems have been prescribed by law for new passenger cars in the European Union,” Lehmann explains. “This does not yet apply to trucks.” In this regard, what is required is the foresight of carriers and the perfect teamwork of the Continental world.